EWS integrates the effect of winds and slope on a surface fire behavior estimate based on the fuel model the fire is expected to be burning in. These tables produce the resulting EWS when winds are blowing upslope. 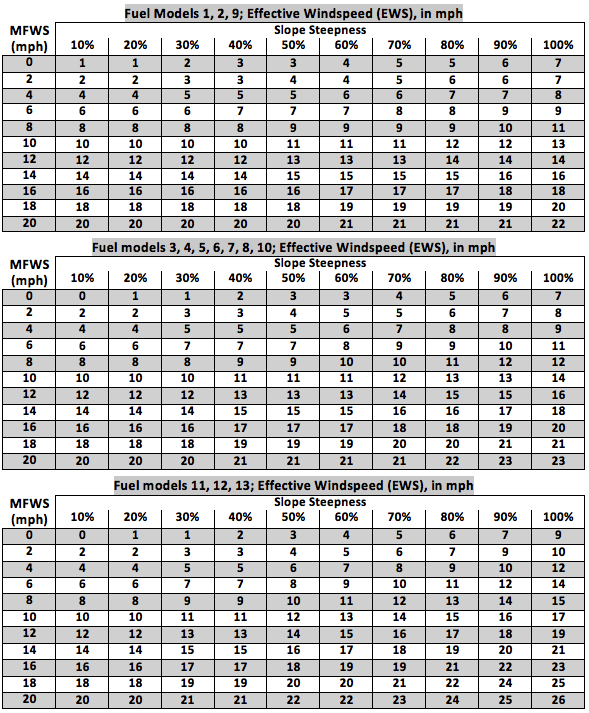 For downslope and cross-slope winds, use the zero (0) mph row in the Midflame Windspeed (MFWS) column to estimate the Slope Equivalent Windspeed. It can be used as the MFWS in the lookup tables to produce slope vector fire behavior estimates for use in the Vectoring Fire Behavior section.